CANNES — Women, gender, equality, diversity and inclusion were once again among the most high-profile conversations at the Cannes Lions International Festival of Creativity this year, with topics ranging from the #MeToo movement to achieving truly balanced and representative creative and leadership teams being raised across the Palais stages and fringe events. Examining how far the industry has come, and how far there is still to go – for women, for people of colour, for the LGBTQ community, and for those from varied socio-economic backgrounds – Cannes concluded that despite some progress there is still much room for improvement. It’s an interesting time for gender, diversity and inclusion as a broad theme for industry events: it’s neither still an edgy (and potentially risky) new bandwagon for brands and agencies to be jumping on, nor has significant, measurable change occurred, for instance at the level of equal pay and representation at junior or board level. In fact, looking past the Croisette cheerleading, a quick glance at the numbers tells a pretty depressing story. The gender pay gap in the PR industry, frustratingly, is actually widening, and the sketchy data available suggests the number of ethnically diverse people in the industry remains embarrassingly low. The balance of men and women in the wider marketing and advertising industry is also off: 32% of CMOs are women, 33% of chief creative officers are women and only 10% of commercials are created by women. Fittingly for an industry that hasn’t yet cracked evaluation, in terms of progress thus far, we can probably say little more than “awareness has been raised,” and we now find ourselves in a period of flux, of shifting sands, of establishing a new norm. In terms of women’s equality (both within the industry and in wider society), the Cannes narrative was wide-ranging, including breaking down gender stereotypes in creative content, what brands can do, and how women can overcome obstacles to playing senior roles in the creative industries. 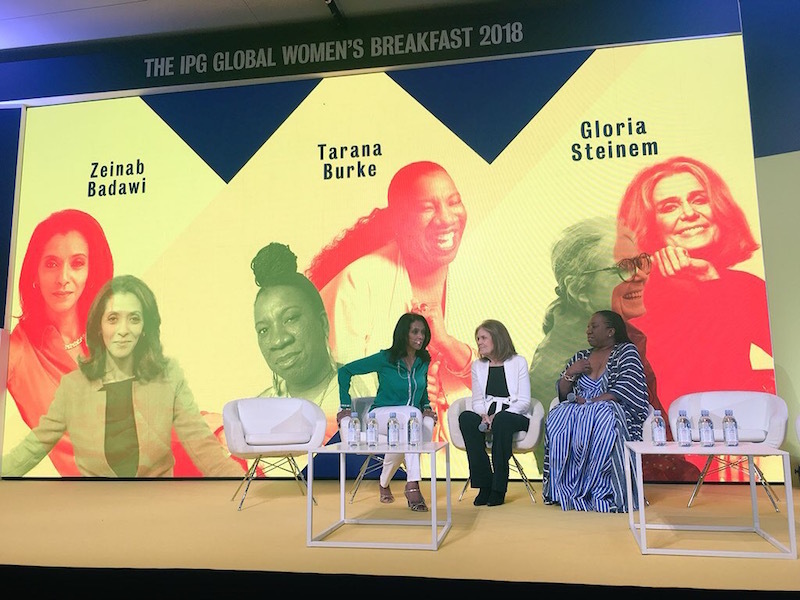 Cannes also had a bono fide feminist hero in its midst this year, as Gloria Steinem took to the stage alongside civil rights activist Tarana Burke, who founded the original #MeToo movement in 2006. Brands have a key role to play in moving the conversation, and the movement, forward. Last year, UN Women convened the Unstereotype Alliance, whose mission is to use advertising as a force for good to drive positive change around “empowering women in all their diversity” and “addressing harmful masculinities to help create a gender equal world." Members now include IPG, WPP, Publicis and Omnicom, Unicef, Unilever, Diageo, P&G, AT&T, Facebook, Microsoft, Mattel and Google. The alliance unveiled a short film at Cannes to underline the problem of all kinds of stereotyping in creative content. P&G sat alongside Unilever in a discussion hosted by WPP’s UK country manager Karen Blackett. Rather than being a "battle of the big guns," it was an unexpectedly emotional session, as Aline Santos, EVP global marketing and head of diversity and inclusion at Unilever, and P&G’s global design officer Phil Duncan talked about brands as a force for societal change, and showcased their own – and each other’s – adverts that they found particularly powerful in turning gender and other stereotypes on their head. These included Unilever’s ground-breaking Dove Campaign for Real Beauty, which started with a white paper with Edelman in 2003 that found only 4% of women described themselves as beautiful, and then working with Ogilvy to debunk traditionally narrow ideas of beauty with a long-term, integrated campaign that evolves (and wins awards) every year. Lucio said it was down to both clients and agencies to take the initiative: “We fundamentally believe that in order to change our industry we need to have a holistic approach. The clients have to have a diverse perspective when they create the briefs, the agencies need to be diverse because they are creating the campaigns. However much it succeeds, or not, to shift the status quo, one thing Cannes is unequivocally good at is inspiration, and there were plenty of inspiring stories about diversity throughout the week. These included Queen Latifah talking about her “uphill battles” of wanting to play ball sports with the boys as a young girl, and then breaking into the male-dominated world of rapping, and Olympian fencer Ibtihaj Mohammed on the difficulties of establishing herself as a young Muslim woman in the sport. Creative director Gabriela Lungu also hosted an emotional evening with ten inspiring women from across the creative industries, both agency and in-house, talking candidly about the many and varied obstacles each had had to overcome in their careers. But for all the “fired up, ready to go” chat across the stages last week, concerns were expressed privately throughout the Festival that we may be on the verge of a D&I backlash; that the focus on the gender pay gap and even #MeToo was “getting boring”; that the industry was inevitably going to be dominated by middle-aged white men forever; and that the gender, race and socio-economic elements of creating a diverse and inclusive working environment that affords equality of opportunity for all were on the verge of becoming a “box-ticking exercise” rather than being done from the heart, out of purpose and for good. After all, outside our creative industry (and certainly outside the sunny Cannes bubble) we live in a society where women have only this week been able to drive in Saudi Arabia and only recently won the right to control what happens to their own bodies in Ireland; where people of colour are still eight times more likely to be stopped and searched by police than white people; where trans people around the world are encountering resistance and abuse; and where there’s still nothing like equality of educational opportunity for kids from disadvantaged backgrounds. There’s still a long way to go; only time will tell whether gender equality, diversity and inclusion will still be quite such hot topics in Cannes next year, or how long it will take before we simply don’t have to have this conversation any more.